This is the only way you’re going to be able to really move the customer experience needle. You’ll get nowhere fast without the buy-in and budget required to do this properly. Make a financial model for customer experience. By building models you can secure resources. Discover the opportunity cost of not doing something (optimising the online checkout, for example, to reduce abandonments). Don’t focus on the 3% (conversion rate), focus on the 97% (of non-converters). It’s not just about resources. There needs to be a long-term commitment to improving the customer experience. A shift in focus towards customer retention is the first step down this path. Be sure to measure the customer experience properly too. 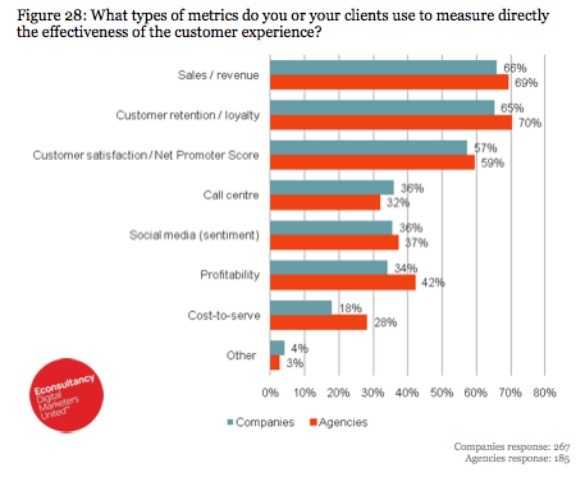 See below for some of the more common customer experience metrics used to evaluate performance. Instead, figure out how people buy. This should be at the heart of your testing programme. Concentrate on the user, not the merchandiser. Be objective in your testing. The data must usurp gut feelings and biases. Also, basic segmentation when testing is a must. For example, you’d be crazy not to split out new vs existing customers. EIP orders are picked, packed and despatched first. EIPs are assigned personal shoppers and invited into the London office for wardrobe planning. EIPs get first dibs at new products (some of which are very limited). EIPs see exclusive previews and presentations. Why not identify your company’s EIPs, and figure out how to make them feel special? One pureplay online retailer I know calls every new customer to say thank you, after an order has been placed via the website. Partly this is about good manners, but it’s also about relationship building, and making the most of the opportunity to connect when the customer is most receptive. Calling every single customer might not feasible for a massive telecoms firm with millions of customers, but it might be worth segmenting the top 1% and giving them special attention. You’ve heard this one before, right? Is it still on your to-do list? Make it happen, especially around forms and in the checkout / registration area! Error messages must be written in the right kind of language. Pay close attention to how you communicate errors, so that when problems occur you can minimise form abandonment. Take a look at the creative 404 pages I unearthed recently for more inspiration beyond forms. This is probably the single easiest way of increasing sales, but it’s also very important from a strategic perspective. Call or email these prospective customers and ask for feedback. Understand what went wrong and then fix those problem areas. I’d suggest that you focus on the experience, rather than the basket, when calling. The sale should be secondary to the feedback (less push, more concern… the soft approach!). In addition, you should segment the high value abandoners. Give priority support to the top x% of your prospective customers. Above all else, find out what makes these people want to leave, and do something about it. Online chat should be prominent and rules driven (for example, if a user is lingering on a form, or other key page). Anticipate when people might need help. Note that one customer services rep can handle three customers concurrently via live chat (unlike the telephone, which is much more costly), so it’s efficient too, as well as being much cheaper (a figure of “20p” was mentioned at Digital Cream, against “many pounds” for the cost of providing traditional service via the telephone). Allow customers to choose a one-hour delivery window. Send a text message when the delivery is en route / near / outside. Offer free delivery (still the most effective promotion tool for online retailers). Don’t overlook the importance of fulfilment, as it impacts the customer experience massively. You’ll know this if you’ve ever wasted a day waiting for a courier to show up. Make no mistake: super-fast, super-efficient delivery can be a real differentiator. The biggest multichannel retailers have launched incredibly successful reserve and collect services. They can account for a huge slice of overall sales. Argos launched its service partly in response to a postal strike, and within one year it accounted for 22% of the retailer’s total sales. If you sell via the high street then you might want to give reserve and collect a whirl. Launch a mobile app that supports it. Promote it extensively in your customer communications. You think m-commerce is still hype? Well, more than 10m UK consumers have already bought something via their mobile phone. That’s a big number, and one that will double in the years ahead. But consumer habits have moved too fast for businesses. M-commerce is still a vastly underdeveloped area, so far as the consumer experience is concerned. Problems occur for 85% of mobile customers during the shopping process. There might be an opportunity here for you to steal a march on your competitors. What else works wonders? Do share your customer experience ideas and insight below.